Stage all the rooms first. There’s nothing worse than multiple photos of messy, overly personalized rooms to send buyers the message that you’re not serious about selling. If you need help with this part, get in touch with us here. Use a professional real estate photographer! I cannot overstate the importance of this. Real estate photography requires a very particular skill set, from actually taking the photos to properly editing the finished product. In Katy, TX and the Houston area, hiring a professional real estate photographer is fairly inexpensive and is almost always a good investment when selling your home. On the left, a vacant room room photographed with an iPhone camera. On the right, a well-staged room photographed with a high quality camera and lens. Stage all the rooms first. It’s important and bears repeating. Use a good camera. A cell phone probably won’t do the job. 5 Megapixels or higher or a DSLR camera is ideal. Use a tripod. None of the professional photographers I’ve worked with use them, but they don’t need to because they’re pros — you’re probably not. A tripod will give you sharper shots. The ideal height is slightly lower than eye level. Get a wide angle lens. A good one is super expensive (another good reason to hire a pro), but they’re critical to get a decent shot of the whole room, especially bathrooms and other small spaces. You can sometimes rent a lens or purchase an inexpensive one online, but be aware they may create a fishbowl effect or other distortion in the photos. Take photos from the doorway or entrance to the room to give buyers the most complete perspective of the space. You can take other pictures from other angles too but definitely include this one. Use as much natural light as possible. Use flash only as a back-up since it can cause unsightly reflections. Your choice of lighting throughout the house also plays a HUGE role in getting great photos. See our blog post on choosing the right light bulb for optimum results. Avoid taking interior pictures at night unless you want your house to look haunted. Stand with the sun to your back when taking exterior shots of the home. Taking photos at an angle (instead of head-on) to give the photo more depth and dimension. If possible, wait for a day with blue skies to minimize the need for editing. When your house is staged right, photographed right, and priced right, you’ll have a listing that’s “just right” for bringing in lots of potential buyers! I hand-painted a gorgeous mural of a tree in my old house. It was fabulous. And when we decided to sell, I cried bitter tears as I painted over it with a boring shade of khaki an inspiring neutral color. So why did I do it? Because I was not willing to bet thousands of dollars of home sale profit on the possibility that I might find a buyer who appreciated my tree mural. What I really wanted was a quick sale and a high profit. And I knew that when selling a home, the walls should act as a backdrop, not as the focal point. This is what a neutral color palette does. It helps homebuyers from all walks of life picture themselves living in the house. It helps them emotionally connect with it and see it as their potential HOME. The tricky part is finding the right neutral color. Not every neutral works for every house. So where do you start? >>First, you need to understand how light will affect the feel of your space. A room with southern exposure receives different light than a room that faces north. Even the color of your light bulbs will affect the way your paint looks. *For specific, easy-to-follow guidance and tips on choosing the best type of light bulb to use for home staging, see our blog post. >>Secondly, assess the fixed elements in the home, like cabinets, tile, flooring, counters, hardware. Is it a cooler palette (blacks, blues, grays, silvery metals, espresso-colored woods)? Or is it a warmer palette (browns, golds, natural wood tones)? The color you choose should accent these elements or you risk creating an off-balance feeling in the room. 7037 Balanced Beige: This reliable, straight forward color is one of my top picks for home sellers. It’s best described as a taupe with an even mixture of both brown and gray, making it flexible enough to match almost any home. It also has a fairly neutral Light Reflective Value so it doesn’t look brighter or darker on the walls than it does in the paint can. It adds more interest and dimension than the standard “builder’s beige,” but it’s still neutral enough to be appealing to a wide variety of home buyers. Transitional dining room using Sherwin-Williams “Balanced Beige.” Design by Atlanta interior designer Pineapple House Interior Design. 6120 Believable Buff and 6106 Kilim Beige: These colors work well in homes that have fixed elements with gold undertones. This shade is a great choice if you’re trying to complement warm color tones, like golds, browns, and woodgrains. 7015 Repose Gray and 7016 Mindful Gray: Both shades are cooler toned grays that work well in homes with black-toned or espresso colored cabinetry and brushed nickel or stainless finishes. 6148 Wool Skein and 7036 Accessible Beige: These colors are shades of taupe that work well with both warm and cool palettes. They also have a slightly higher than average Light Reflective Value, which means they do a great job of bringing light into dark spaces. 7029 Agreeable Gray and 7030 Anew Gray: These warm toned grays are exceptionally versatile and hugely popular with homebuyers right now. Do you have experience with any of these paint colors? What are your favorite neutrals? If you need help choosing a paint color for your home, we can help! Contact Three Bears Home Staging for a Walk & Talk Consultation and we’ll help you choose the color that works best for you! Great Paint Colors for Home Staging or Selling Your House: Taupe! Last Monday, Sherwin-Williams revealed its 2017 Color of the Year, and as a home stager I am 100% behind their choice: Poised Taupe! Taupe gets a lot of criticism for being a boring, safe choice, but when styled right it can add a lot of interest. Taupe is a great background for pops of color and bold prints. It also adds a little more interest than a cold gray or plain beige. What I love about taupe is it’s versatility — it’s the perfect blend of gray and brown, warm and cool, light and dark. Having a color like that in your arsenal can be incredibly powerful if you’re preparing your home for sale. For home sellers who want to give a more modern feel to a home full of wood accents and brown toned tile and stone, taupe paint can be an effective and inexpensive way to create a more modern feel that still complements the more permanent elements of the house. One of my personal favorites for home sellers is Sherwin-Williams Tony Taupe (I’ve even used it in my own home). Soft and subtle, it’s the perfect neutral to complement a wide array of both cool and warm colors. Taupes and other neutrals aren’t really that exciting, but for a home that’s on the market, these colors usually present an ideal view of your home in terms of size, shape, and mood. They also allow buyers to envision themselves and their belongings in the home without being swayed by your personal design style. Do you have a favorite shade of taupe? (*Yes, I realize that question sounds a little bizarre if you’re not into that sort of thing, but if you’ve ever picked out what you thought was a “neutral” only to find it had a weird pink or yellow undertone, you’ll know what I’m talking about) What’s your favorite neutral? If you need a little help picking one out, give the experts at Three Bears Home Staging a call at (832) 377-0785 to set up a color consultation! A few weeks ago my husband and I noticed a home we’d had our eye on for several months dropped the price. We decided to take a leap of faith, made an offer, and it was accepted! “Next step: we have to have put our current home on the market and get a sales contract within 14 days,” my real estate agent/husband told me. I will no longer use the phrase “de-clutter” when talking to my clients. I don’t think I had realized how emotionally charged this word feels. Doing what I do, I am constantly reminded of the need to simplify my surroundings. I keep things extremely neat, tidy, and organized around my home and felt fairly confident I’d be able to get our home staged in no time flat. Staging is an important part of emotionally disconnecting with your home. I raised my little ones in this home. My husband and I experienced personal and professional milestones in this home. We needed more space for our growing family and growing business, but it was breaking my heart a little to leave this place that held so many memories. Enter home staging…my professional mind knew this needed to happen. My bookshelves were carefully organized — but they needed to be less full, less personalized, less distracting to potential buyers. The walls had gorgeous family photos (and murals!) —but they needed to come down so buyers could visualize their own family living there. My kids had adorable play sets and large toys — but they needed to be packed away so buyers could see how spacious the room was. As I busily packed away treasured items and repainted spaces, as it gradually became less personal and felt less like OUR home, we began that all-important process of detachment and we all began to grow more excited about moving to the new house. It is so worth it! 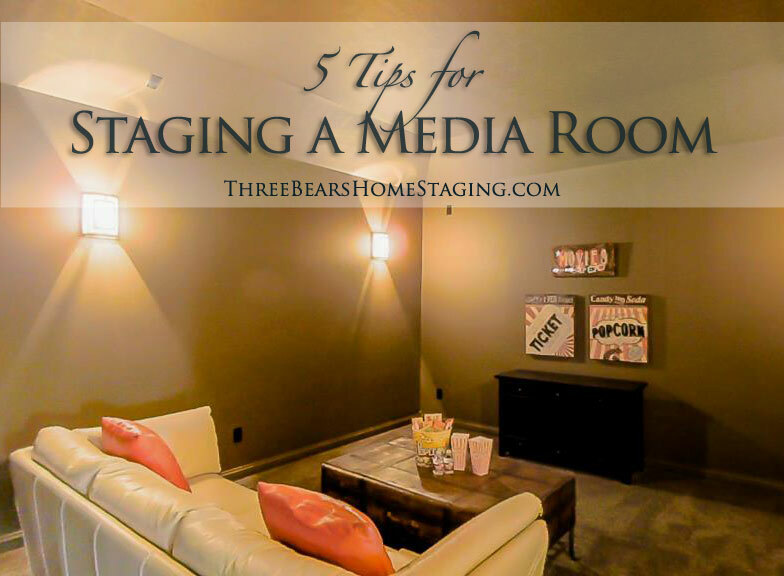 Staging your home — and living in a staged home — is without question a completely stressful experience. Your world is upside down while you move, reorganize, camouflage, rearrange, and neurotically clean every facet of what has always been your sanctuary. You chase after every crumb with a wet sponge, yell at people for daring to sit on a couch with freshly fluffed pillows, painstakingly make the bed with ALL the throw pillows every day…but if you do stage it right and if you price it right, the offers WILL come. And then you can start to relax again and look forward with excitement to a future in your brand new home! Getting your home ready to go on the market can be incredibly stressful, but we can help! If you need a hand getting your Katy, Texas home ready to sell, please give Three Bears Home Staging and Redesign a call at (832) 377-0785 or contact us here.